I realized I could give so much more | KaBOOM! "It was just a typical Wednesday afternoon in April, and I had no idea what I was about to get myself into. I was picking up my kids after school and heard about a meeting taking place down the hall. They promised a free meal and some entertainment for my kids, and that sounded like a good deal to me. I went over and found out that KaBOOM! was going to be building a new playground at my local community center. As I was enjoying a hot bowl of stew my kids were drawing their dream designs for the new playground, I was hooked. As the weeks of planning went on I found myself taking on more and more. 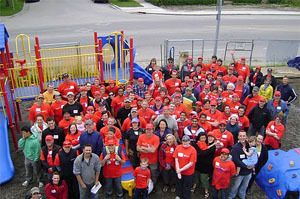 Before I knew it I was leading the Food Committee and was walking around my neighborhood asking for donations of food – enough to feed the nearly 200 volunteers we expected on Build Day. I realized how much I was really capable of taking on. Before this project I was a single mom just doing the best for my kids, but the KaBOOM! project made me feel like I could give so much more. On Build Day all my efforts were totally worth it. It made me realize how strong of a person I really am and how much more I can give, and that is something I’m reminded of every day when I walk by the playground or watch my kids play on it." Jesse discovered a motivation and drive in herself she thought she’d lost a long time ago. With the new playground serving as tangible evidence of what she can accomplish she’s already on the lookout for another opportunity to make a difference. Play it forward with a donation today to help people like Jesse realize how much power they really have.